If you’re anything like me then you’ll love the atmospheric lighting that candles bring, not to mention the endless options of fragrance! Jar candles are hugely popular but so many people throw out the jars once the candles are finished. The jars are a really pretty shape and have so much potential. They are great for storing small things like hair bands, jewellery, buttons and cotton wool buds. They are also great for displaying little curios, sweets and dried flowers and take very little effort to achieve. Once the candles are burnt down and finished, you need to clean the jars in preparation for their new use. The easiest way to remove the wax is to set the jar in a sink and fill the jar with boiling water. The boiling water will melt the wax and the wax will float to the top of the jar, making it easier to remove. Leave the jar to sit until the water cools and it is safe to touch. The wax will form a solid seal at the top of the jar. Using a knife, carefully cut the disc of wax along the edge of the glass and discard. If there is still a considerable amount of wax residue left in the jar you can repeat this process. When you are happy that all the wax is removed you can wash the jar with a little washing-up liquid and warm water. A pot scrubber will help remove any labels and sticky residue, but if they are particularly stubborn you may want to try rubbing some baby oil or even olive oil on the sticky residue, before scrubbing with a pot scrubber and cleaning in warm soapy water. 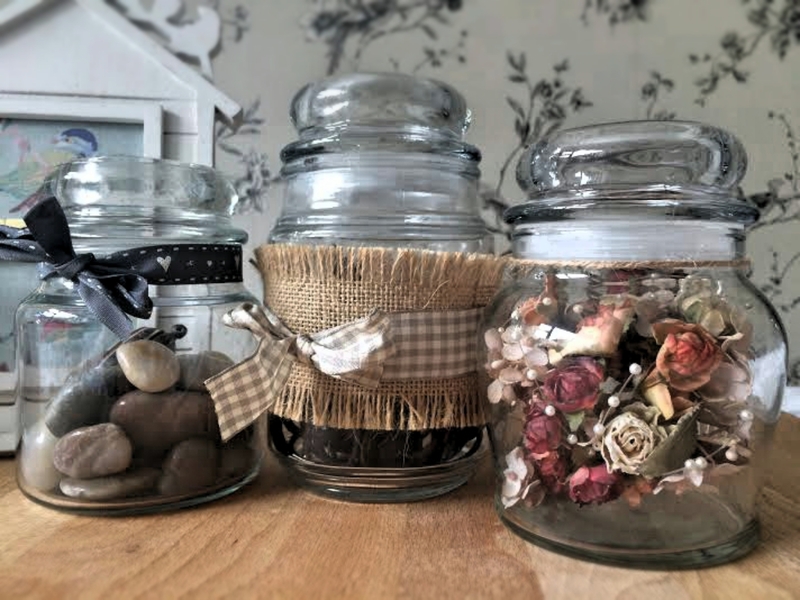 If you are going to use the jars to display curios or dried flowers you may wish to add just a little embellishment or even leave the jars plain so that you can clearly see what is inside. Tying a ribbon around the neck of a jar, or adding a luggage tag and brown string is a simple way of adding interest. 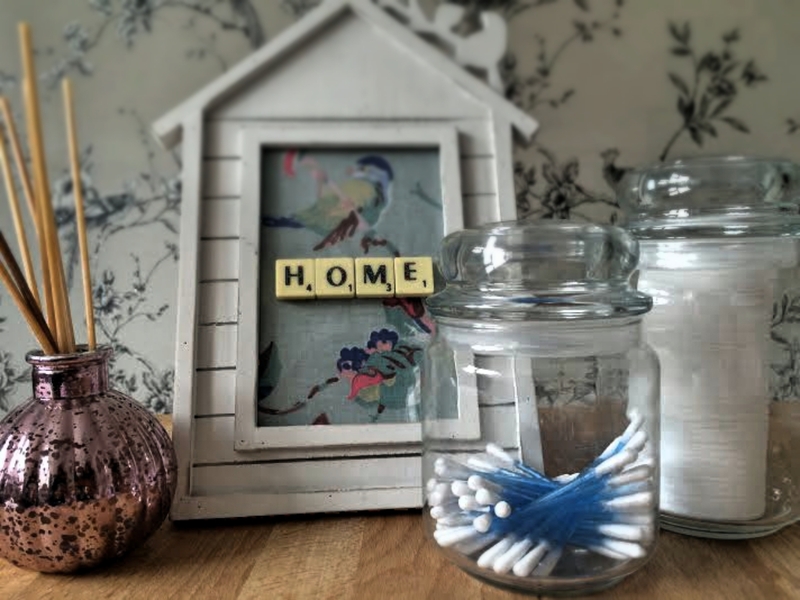 If you want to use the jars for storage you could add some embellishment to make them a little prettier. 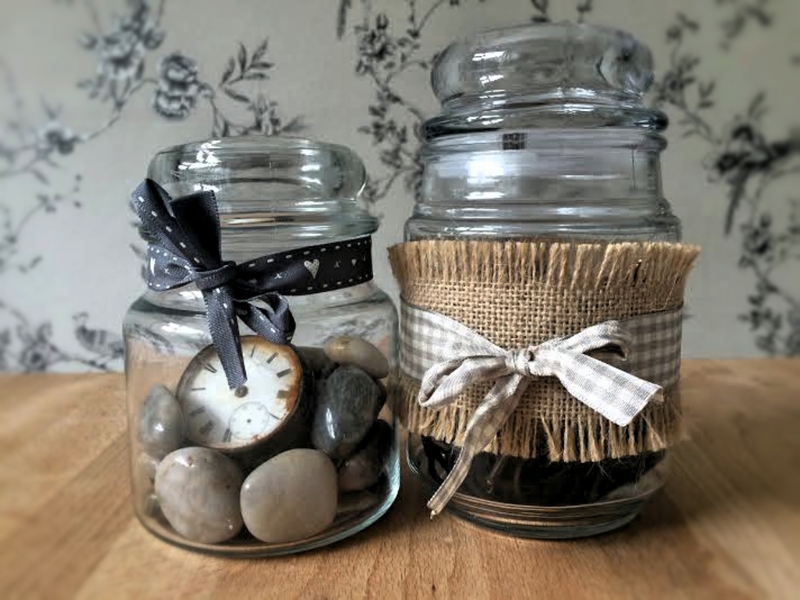 Wrapping a little hessian and ribbon around the jar and securing with some double sided tape is an inexpensive trick. You can buy a metre of ribbon or hessian for as little as £1. 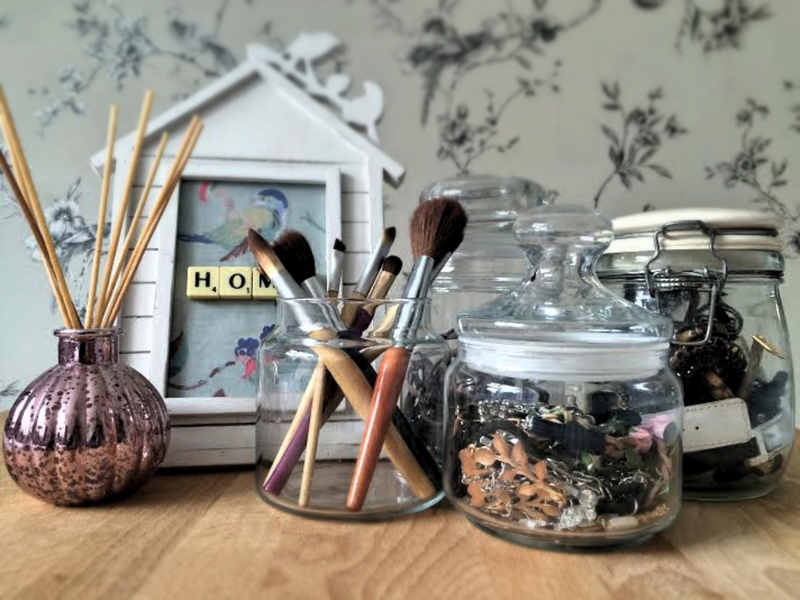 The jars are great for storing small things like jewellery, buttons and hair bands. You can easily make pretty displays by adding a few pebbles, some shells or dried flowers. I added an old pocket watch to some polished stones and tied a ribbon around one of my jars. I also displayed a hair piece made of pretty paper flowers from when I was a flower girl as a child. 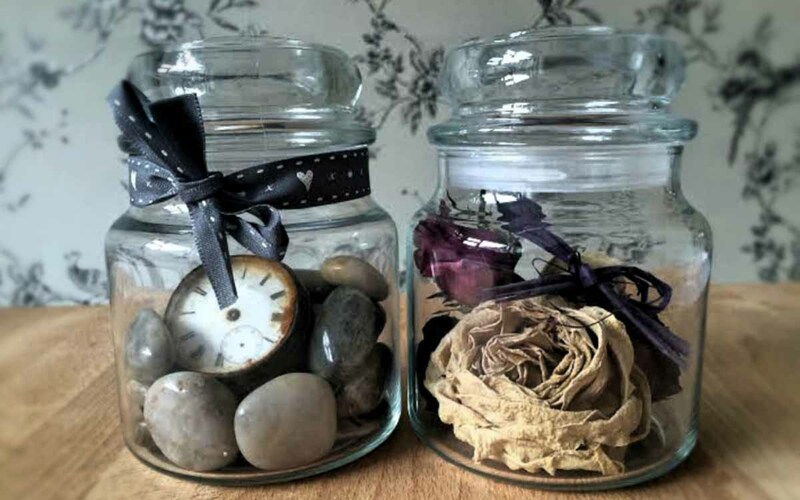 These jars are perfect for displaying keepsakes and mementos. Why not make your displays seasonal by adding some fake snow and pine cones at Christmas, or moss, twigs and feathers at Easter. Do you re-use jar candles? What is your favourite use? Let us know below in the comments or by connecting on Twitter or Facebook.